Parents, before your high school graduate decides where to attend college this fall, make sure you both read the information below. Attending an elite college will not make you happier later in life. 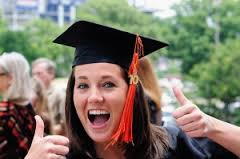 A new nation-wide Gallup survey of 30,000 college graduates of all age groups found that attending an elite college does not result in more engaged or successful workers, or happier, satisfied people. What does seem to generate happiness and success down the road is an enriching college experience with inspiring professors and a love of learning. The Gallup research suggests that “the factors that should be guiding college decisions are not selectivity or prestige, but cost of attendance, great teaching and deep learning, in that order,” writes Anya Kamenetz for NPR. Attending an elite school does not mean you will make more money. It seems that smart, ambitious people will be successful regardless of the institution’s name on their diploma. Previous studies have shown no link between expensive private colleges and later salaries for graduates. “Income is much more closely tied to a person’s choice of a major, ” says NPR’s Kamenetz. Graduating with a lot of debt can sink your overall satisfaction with life. The Gallup study revealed that students with no college debt are much more likely to report that they are “thriving,” meaning they’re reporting personal satisfaction and success in almost all aspects of their lives. Graduates with the average debt amount of $30,000 are only one-fifth as likely to report the same degree of satisfaction with their lives. As we know from working with clients and their college-age children, college debt is a heavy burden that can easily derail your future plans for marriage, home buying, and starting a family. Unless you are destined for an extremely high earning career, anything but minimal debt is probably not worth it. The message for students is clear, says lead education researcher Brandon Busteed at Gallup.